* High fashion at an excellent wholesale price describe these irresistable Mariell Wedding Earrings. 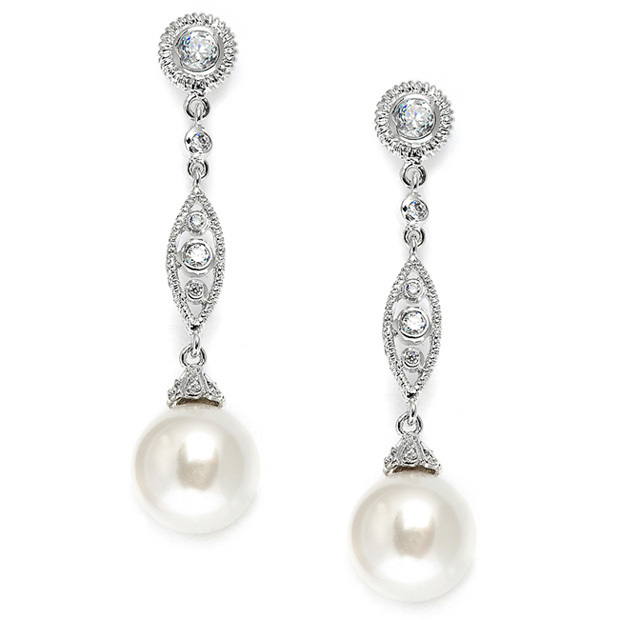 * They have a glistening textured bezel set CZ stud top with a modern filigree dangle and a 12mm soft creme pearl drop. * These chic earrings are the perfect finishing touch for any bridal or bridesmaid gown. * These irresistable rhodium plated 1 7/8" Mariell Wedding Earring are chic and well-priced! * They have a shimmering textured bezel set CZ stud with a modern filigree dangle and a 12mm soft cream pearl drop perfect to accent any bridal or bridesmaid gown.